Sometimes I like to add more than just a picture to a frame. My wife needed a little bit of crafty goodness at the office so I whipped this together for her. 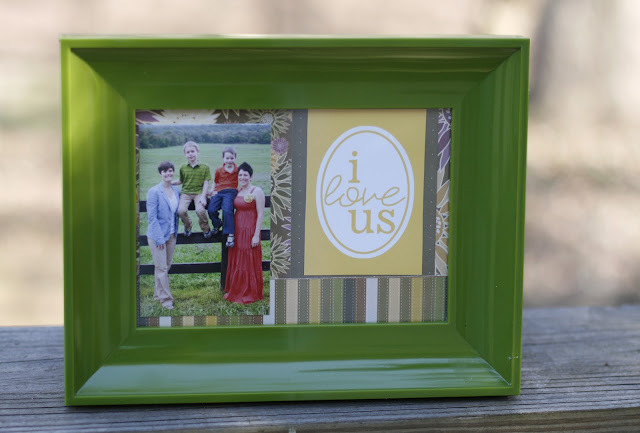 I downloaded the free "I Love Us" card from eighteen25, comes in four great colors. I used scrapbook paper that I had in my stash and picked up the funky frame at Target for less than 5 bucks. Try scrapbooking in a frame and enhance the ambiance of someone's cubicle, link a picture in the comments.